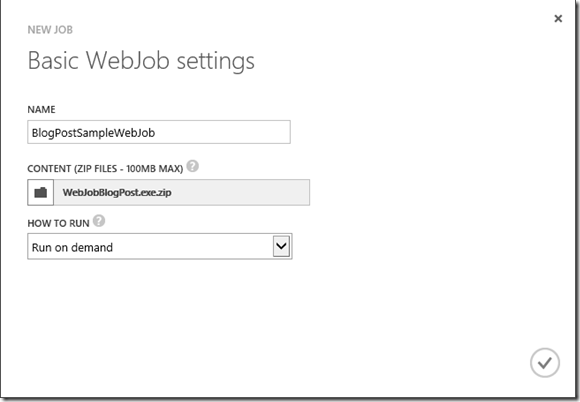 With Windows Azure Pack Websites V2 Update Rollup 6 support was added for WebJobs – Using WebJobs in Windows Azure Pack V2. 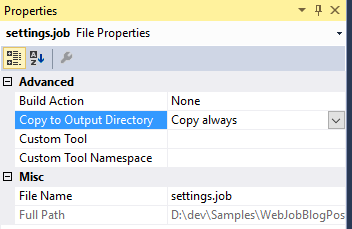 WebJobs are executable files running as a background process in the context of a Web App, the executable file can be such as a cmd, bat, exe (.Net), ps1, sh, php, py, js and jar. 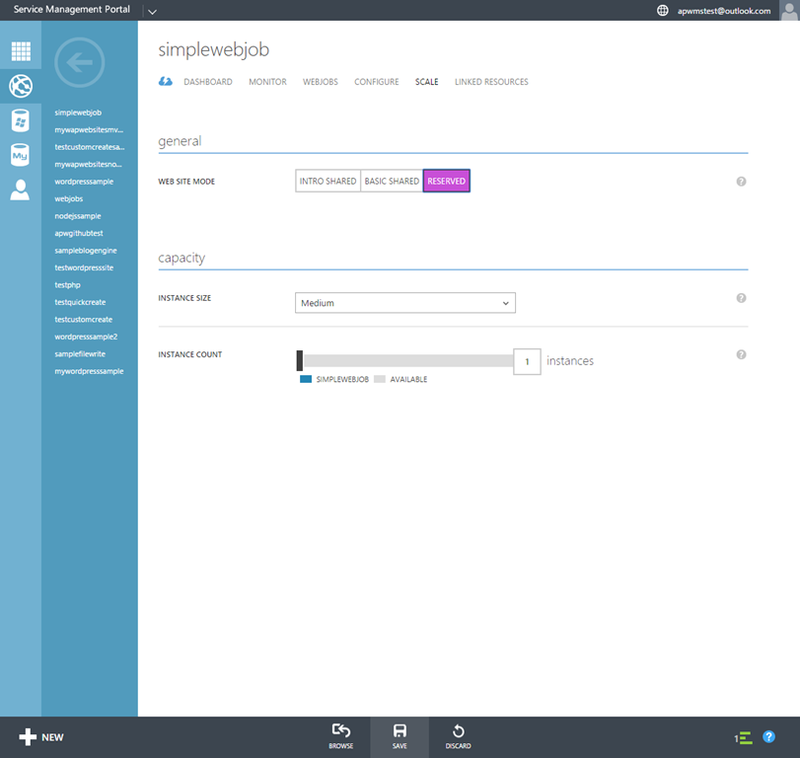 One of the limitations of Windows Azure Pack and subsequently WebJobs on Azure Pack is that the lack of Scheduler in Azure Pack which prevents the running of WebJobs on a Schedule. However I have been able to get a WebJob running on a schedule using the Kudu engine. In the tenant portal, create a website. Enter a username and password and click the tick button to save the changes. 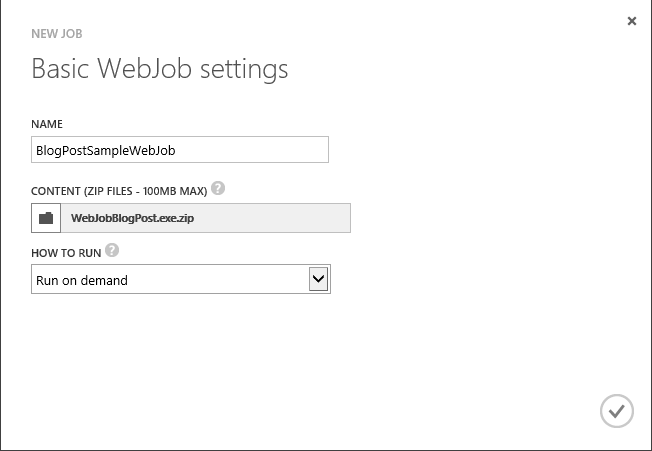 Let me walkthrough what I did to create a simple on-demand WebJob which will run on a schedule and deploy it to my Windows Azure Pack Websites deployment. 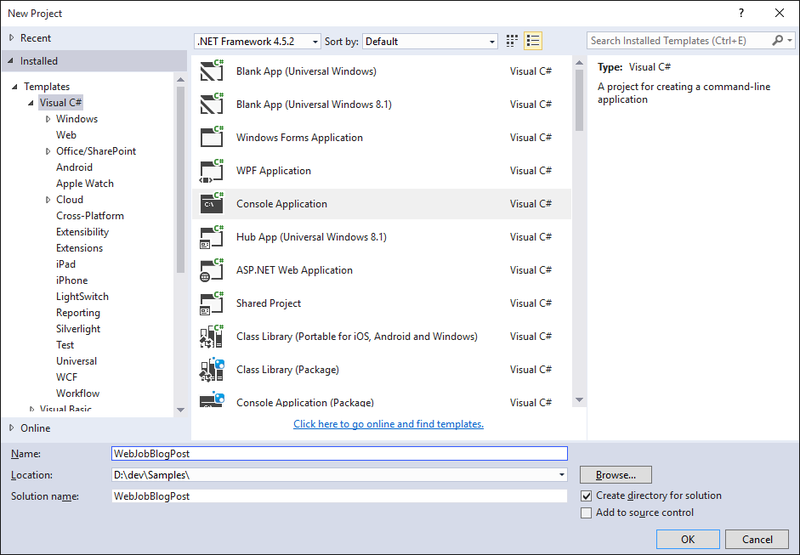 My preference is to work with .Net so my example is built using C#. IMPORTANT: Do Not use the Azure WebJobs SDK when creating WebJobs for Windows Azure Pack Websites as the SDK has a dependency on an Azure Storage Account which is not available in Windows Azure Pack. Edit the Main method of Program.cs to add functionality to your WebJob. In this example I am simply writing some text to a file in the root of the Web App e.g. "schedule":  "0 */5 * * * *"
Save the file and then rebuild the project. 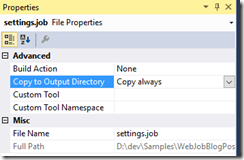 Create a zip file of the output and ensure the settings.job file is also added to the zip file. There you have it! 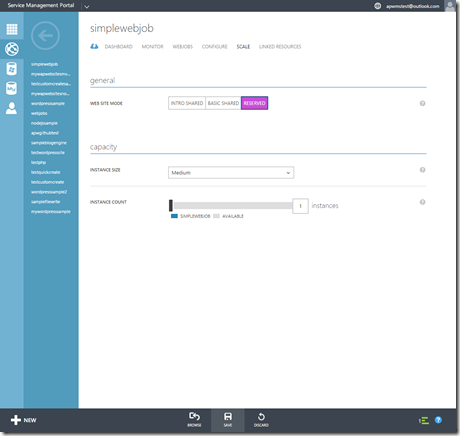 A WebJob running to a schedule on Windows Azure Pack Websites v2 Update Rollup 9 making use of the CRON scheduler capability within Project Kudu. A lot has happened since I last wrote a post on my blog way back in October 2014! 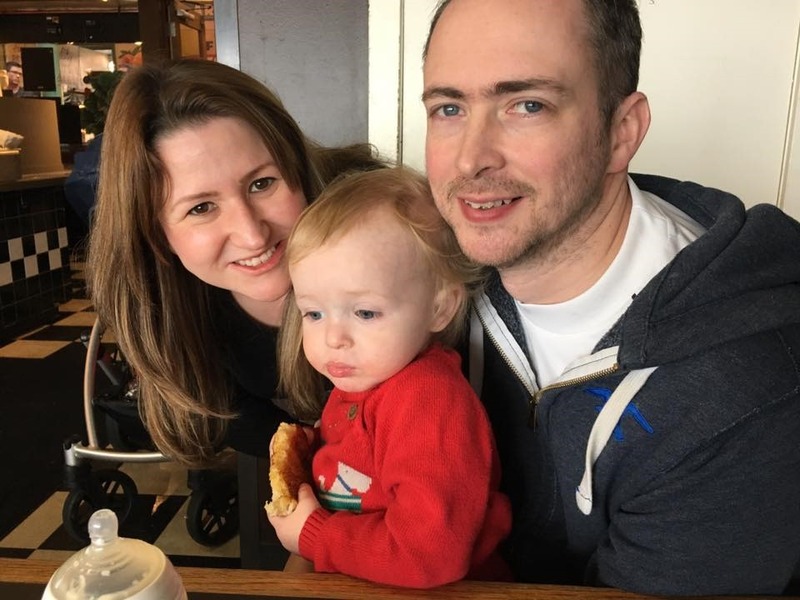 My son was born in December 2014 and we have since celebrated his first birthday too! 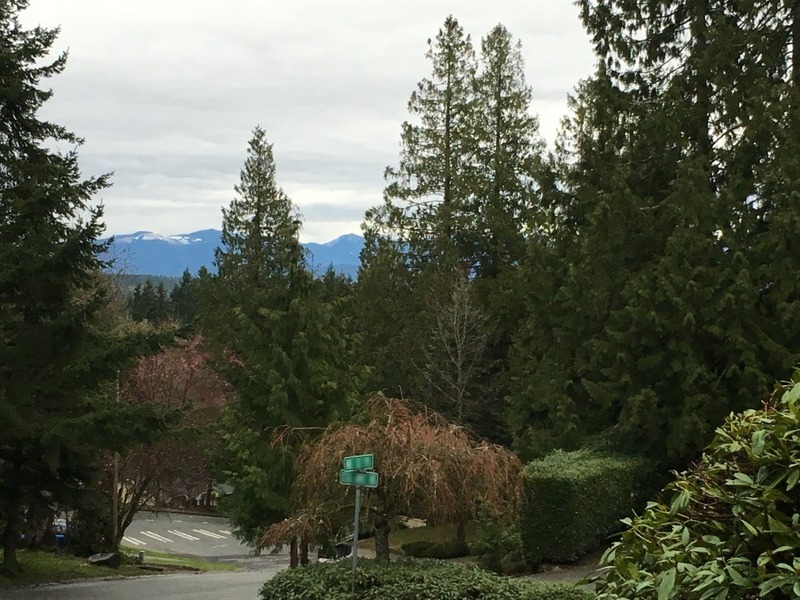 Oh and we have had the small matter of relocating four and half thousand miles from Sunderland, UK to Redmond, Washington, USA!! Back in July 2014 I joined Microsoft as Program Manager on what was then Azure Websites, Azure App Service. My role includes working on the public cloud product – Azure App Service, the on-premises product – Windows Azure Pack Websites and the future of the service on premises – App Service on Azure Stack and I am also still involved with some of the out of band modules for IIS. Outside of work I have stepped back from some of my community work, but not completely, to devote more time to my family . 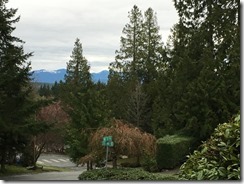 I am still involved with DDD North remotely and I will likely get involved in the community in and around Redmond but will scale up or down over time. I am also hoping to restart blogging reasonably regularly and will be updating the blog theme over the coming weeks and months. I’ll also be on hand to answer questions on our Azure Websites stand in the TechExpo, along with being around the event all week at the Welcome Reception, Happy Hour, Ask The Experts session and Country Drinks. 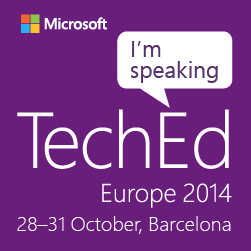 Looking forward to talking to lots of people about Azure Websites! On Monday 28th July 2014, I retired from the Microsoft MVP Program after 7 years! The MVP Program is a fantastic honour and privilege to be a part of and I have interacted with many, many fantastic peers and community members over the years. I’ve had to retire because I have joined Microsoft as a Program Manager on the Microsoft Azure Websites Team, a very exciting and interesting opportunity for me! I’m looking forward to getting up to speed quickly and working with my new team. I’ll still be as active as I used to be in the community, workload permitting, and look forward to seeing many of you at NEBytes and DDD North as it’s business as usual with both of those. 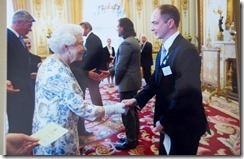 An Invite to the Palace! 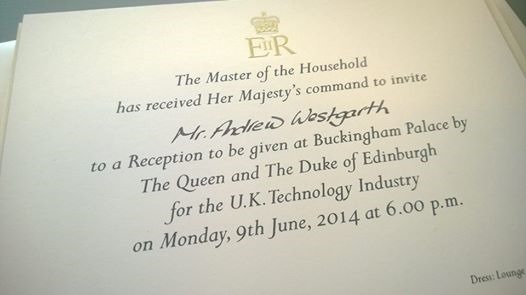 Last month I was extremely surprised and honoured to receive an invite to a UK Technology Reception with The Queen and The Duke of Edinburgh at Buckingham Palace on Monday 9th June 2014. The reception was hosted by The Duke of York and I was among 350 guests from all over the UK Technology industry invited to this fantastic occasion. I received my invite for the work I’ve done in the community with user groups such as NEBytes and events such as DDD North and Imagine Cup North East, which is very humbling as I love the work I do in the community and think of it more as a hobby than actual work, many thanks to everyone in the community who has supported the events, students and our fantastic user group here in the North East! I joined other representatives from the North East Technology Community, David Dunn – CEO of Sunderland Software City, Kevin Beales – CEO of Sunderland based Test Factory, Mike Fish – Managing Director of Dontyne Systems, Ajay Sood – Managing Director of Orchid Software and Workcast Director Gerrard Callaghan, among many others. 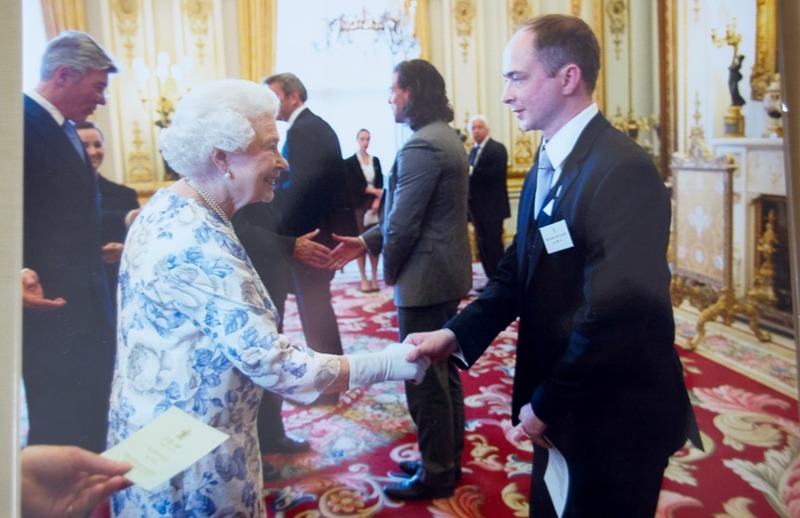 We were all privileged to be introduced to both The Queen and The Duke of Edinburgh and we discussed the UK Technology Industry with our peers throughout a very pleasant evening. An experience I am very proud of and very grateful for the opportunity, certainly one to remember and what a great picture to put in the family album! Awarded Microsoft MVP Award for Seventh Year! This afternoon I received an email from Microsoft to tell me that I’d been awarded the 2014 Microsoft MVP Award for ASP.Net/IIS! This is my seventh MVP Award, I am extremely humble and privileged to be associated with a great group of less than 5000 technical people around the globe. I’ll be aiming to continue my efforts to help the community and deliver as much content as I can to aid and spread knowledge through events, blogging and social media among other avenues. This morning I am delighted to announce that DDD North 2014 will be held at the University of Leeds on Saturday 18th October 2014. 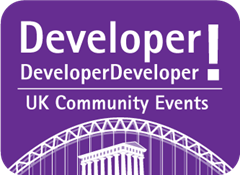 DDD North is a free one day technical event for developers. This is the fourth Developer! Developer! Developer! Community Event ever ran in the North of England and we are delighted to be hosted at the University of Leeds following on from our three previous events with registrations rising over 425 last year! DDD North is a day of learning, discussion, contribution and involvement in the community in the North East, North West, Midlands and Scotland. 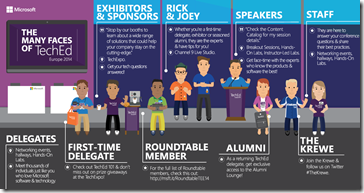 The goal of DDD North is to provide free technical education with the added benefit of the networking possibilities with peers and the development of relationships across the .NET Industry! For quite some time now I’ve been planning on writing a few blog posts about my experiences with NDepend. NDepend is often described as a “Swiss Amy Knife for .NET developers” and I must admit there are plenty features to investigate and get to grips with. 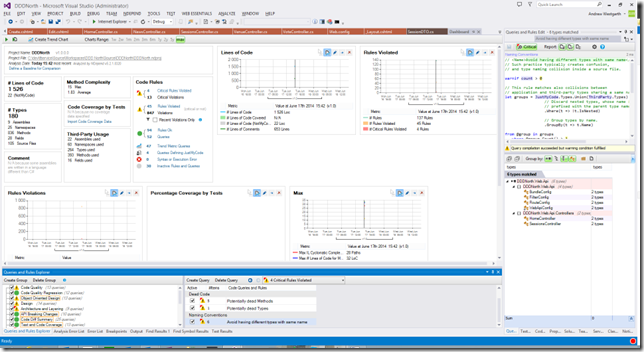 NDepend analyses your code base against a number of code rules to check against best practice to help to ensure that the code you produce is of a high quality and doesn’t degrade over time, for more details on the wide range of features checkout the list at http://www.ndepend.com/Features.aspx. As you can see there is a huge amount of data and information reported by NDepend. I am now in the process of going through each element and looking at items such as the results from the Code Rules tests, Dependency Graphs, Matrices and many more application statistics. I’ll follow up this blog post with a look at each of the elements I discover in the report and how I’ve used the information to make my code base better. 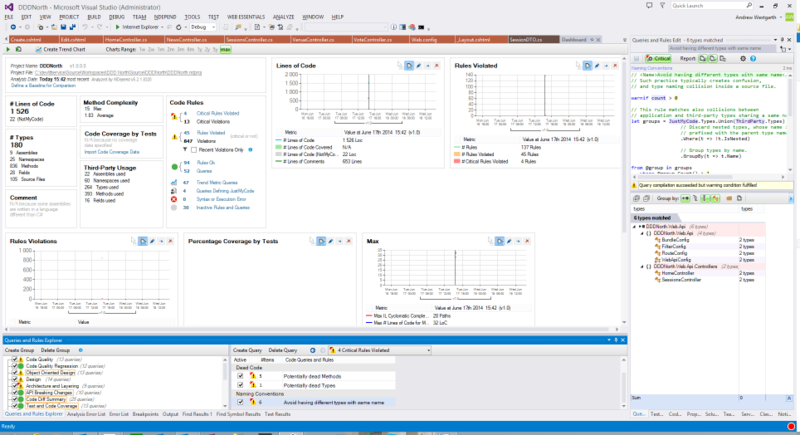 In the meantime if you’d like to take a look at NDepend you can get a 14 day fully functional trial from here http://www.ndepend.com/NDependDownload.aspx with Getting Started documentation and videos here - http://www.ndepend.com/GettingStarted.aspx. 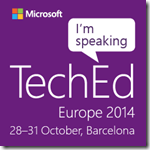 In addition why not check out Erik Dietrich’s great course – Practical NDepend on Pluralsight! Last night I had the pleasure of presenting at Dot Net Notts (@dotnetnotts), a relatively new User Group in Nottingham. Having been born in Nottingham, it was a really nice experience to go back visit some family and then present at this vibrant and welcoming new user group. Recently I’ve been working with Elasticsearch as I look to implement a logging solution using Logstash. Elasticsearch is a popular, flexible open source real-time search and analytics engine and I’ve been looking at making use of the engine to perform full text searches and analytics against the mountains of log data we have on our platform. As part of this work I’ve been setting up an Elasticsearch cluster of three Windows Server 2012 R2 Datacenter edition virtual machines in Windows Azure. We’ve chosen Windows based virtual machines as the team who will support it have more experience and knowledge of Windows OS than Linux. 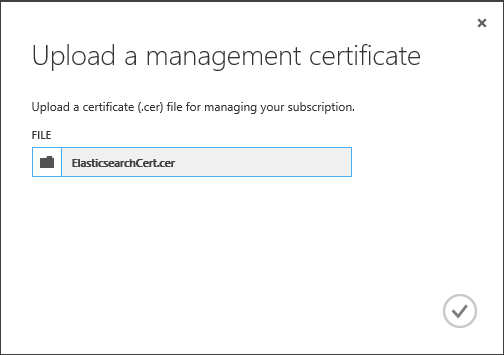 To get up an running I’ve used the following blog post from Thomas Ardal, which has a further link to info on installing Elasticsearch on the VMS – Running ElasticSearch in a cluster on Azure. One of the elements of configuring the cluster concerns the discovery of nodes in the cluster. By default Elasticsearch makes use of multicast to discover the nodes in the cluster, however multicast doesn’t appear to work fully in Azure at present, therefore Thomas’ blog post details making changes to the elasticsearch.yml configuration file to disable multicast and add in the node ip addresses manually. However on Friday (31st Jan 2014) Elasticsearch announced an Azure Cloud Plugin for Elasticsearch and the goal for this plugin is to enable automatic unicast discovery of Windows Azure Virtual Machines in the Cloud Service. The article details how to set the plugin up in Linux Virtual Machines, but as I’ve already mentioned we are using Windows Server 2012 R2 for all of our virtual machines in the cluster. Therefore I set off today to configure the plugin for running Elasticsearch on Windows. 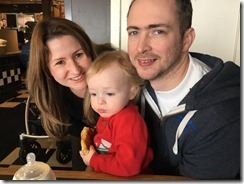 Create Windows Azure VMs as detailed in Thomas’ post, installing Elasticsearch on each Virtual Machine you wish to use as a node. 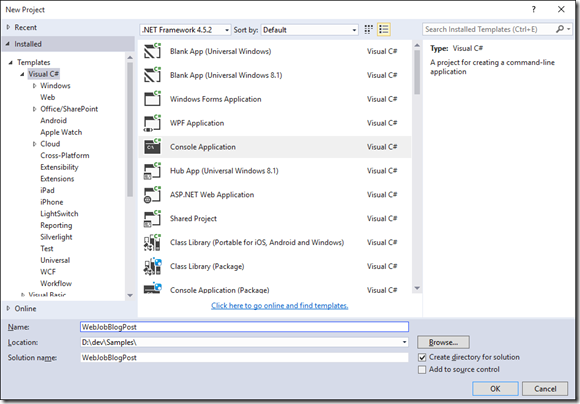 Create a self-signed certificate for working with the Azure REST API using makecert (You will need the Windows SDK for this in order to make use of makecert). 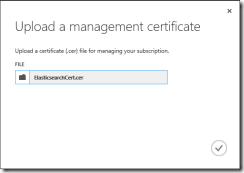 Upload the .cer file to the Management Certificates (Settings->Management Certificates) store for your Azure subscription in the Azure Portal. 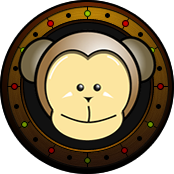 Thanks to David Pilato and Thomas Conté for their help in getting the configuration correctly formatted and populated. WARNING: As a side note, it’s VERY easy to break the syntax in yml files when not familiar with them, I’m now using Notepad++ to work with them and I’ve also been using a VS Extension – YamlDotNetEditor - when editing the yml file so I can reduce the risk of making mistakes. The extension formats and lays out the file in a readable format with syntax highlighting (although this is currently not working in VS2013).